Laura is mom to three adult children – Linda, Chris, and Jenny. Linda and Chris receive services from DSC and live at home with Laura and dad, John. Raising children is difficult; it is truly one the most difficult and important jobs, any of us will ever have. With all the blessings that come with raising children, there are also challenges. 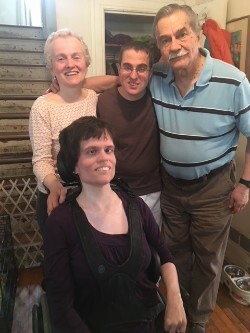 For Laura and John, raising two children with disabilities did pose challenges over the years, some of which still exist today. The first 10 years of Linda’s life included frequent hospitalizations. Laura shares, “it was difficult to plan ahead for anything. We just lived day by day.” Laura also shared the difficulties the family has with travel due to Linda’s disabilities that include feeding through a gastrostomy tube and adult diaper changes. Laura noted that while many restrooms have diaper-changing stations, they are not made for adults, which limits many choices for the family. Like all parents, Laura shares she has learned to “pick my battles” and finds comfort in their routines at home. She also loves when daughter, Jenny, can make it home from college so they can all share time together. Happy Mother’s Day, Laura and thanks for all you do!